The Master Plancha EX pairs the latest burner technology with smart features to offer the ultimate in plancha cooking convenience. Its smooth cooking surface is ideal for cooking a range of dishes, especially more fragile vegetables, meats and fish. Firing up the Master Plancha EX is quick and simple thanks to our InstaStart technology and integrated vents make it easy to check that the burners are lit. Illuminated control dials add to the barbecue’s stylish appeal and make it easy to adjust the temperature as night falls. For ultimate performance, the Plancha Master EX features our new Blue Flame technology offering outstandingly reliable heat across the whole cooking area. The large cooking surface is constructed from enamelled cast iron which effectively conducts heat for perfectly cooked food every time. 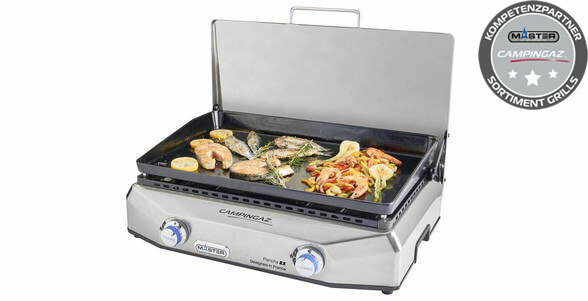 With a deluxe, stainless steel construction, the Master Plancha EX has an integrated lid that shields wind and protects the cooking surface when not in use. Adjustable legs make it easy to adapt the height of the barbecue to your surroundings. Once you have finished cooking, the Master Plancha EX has been designed for easy cleaning with a removable grease cup that can be washed in the dishwasher.